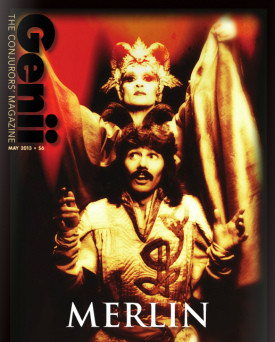 The ultimate, most comprehensive guide to one of mentalism's most versatile routines. John Archer has performed this routine all over the world and it has become one of his signature pieces. Imagine being anywhere in the world, grabbing a couple of coins, some gaffer tape, a blindfold, pen and paper from the local store and being able to perform a hilarious twenty minute, mind-blowing routine! Now for the first time, John goes in-depth to explain all the secrets and nuances that have made this one of his most requested effects. This is not just a quick trick, it is an entire act that builds and builds into a standing ovation finale. This is the real work on the blindfold routine and it will open up a world of possibilities. Shot in front of a live audience, you will experience John at his very best, performing the routine, and then he goes into every little detail with you, in an informal discussion-style explanation, which is equally entertaining. 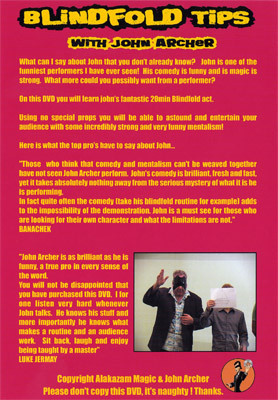 "Those who think that comedy and mentalism can't be weaved together have not seen John Archer perform. John's comedy is brilliant, fresh and fast, yet it takes absolutely nothing away from the serious mystery of what it is he is performing. In fact quite often the comedy (take his blindfold routine for example) adds to the impossibility of the demonstration. John is a must see for those who are looking for their own character and what the limitations are not." "John Archer is as brilliant as he is funny, a true pro in every sense of the word. You will not be disappointed that you have purchased this DVD. I for one listen very hard whenever John talks. He knows his stuff and more importantly he knows what makes a routine and an audience work. Sit back, laugh and enjoy being taught by a master"